Summer is almost here! That means it’s time to put away the hearty soups and stews and choose lighter fare that will be perfect for eating out on the back deck all summer long. This summer, instead of making the same old boring chicken strips for your children again and again, why not make a more sophisticated buffalo chicken recipe the entire family will love? Buffalo Chicken Strips are a summertime classic. Try them once, and you’re sure to make them again and again. After all, they aren’t very difficult to make. Simply mix the dry ingredients together, dip the chicken and fry in a pan until they’re done. And if you ever have problems with the outside getting too crispy before the inside is done–let me let you in on a little secret. Simply fry these only until the outside is golden brown, and then transfer to a baking sheet to finish heating through in the oven. You shouldn’t have that problem with this buffalo chicken recipe, but that’s my secret for making sure my pan-fried foods are cooked perfectly every time! 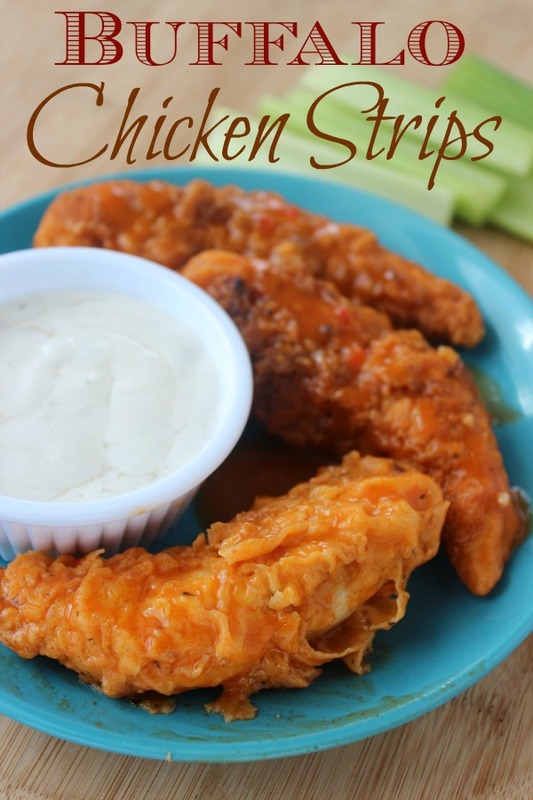 Pair with celery and bleu cheese and these Buffalo Chicken Strips make for an easy and delicious dinner that is perfect for a lazy summer evening spent outside. Enjoy!